Mexican authorities have accused an officer in the presidential guard of being a spy for a drug cartel. Army Maj Arturo Gonzalez Rodriguez has been placed under house arrest for 40 days while he is investigated. 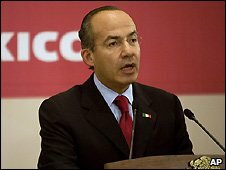 He is accused of selling information about President Felipe Calderon's movements to the Beltran Leyva cartel for payments of up to $100,000. Mr Calderon has deployed thousands of troops and police against the cartels in an increasingly bloody war. An official in Mr Calderon's office said Maj Gonzalez was not part of the elite army detachment providing close protection to the president, Associated Press news agency reported. Maj Gonzalez was detained as part of "Operation Cleanup", in which more than a dozen high-ranking police and government officials have been arrested on similar charges of collaborating with drug cartels. Nearly 5,400 people have been murdered in drugs-related violence this year and Mexico's top prosecutor has said that the violence is likely to worsen in 2009 as drug gangs split and fight for turf. Last week, the decapitated bodies of eight soldiers were found in a town near Acapulco. Their heads were discovered stuffed into plastic bags outside a shopping centre.